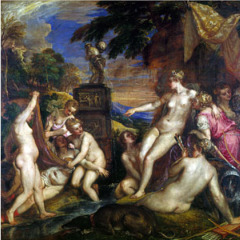 LATE last month , the High Museum in Atlanta announced that two masterpieces of the Italian Renaissance — Titian's "Diana and Actaeon" and "Diana and Callisto" — plus 23 other Venetian works would be coming to town next fall, on loan from the National Galleries of Scotland. It was enough to make art lovers swoon. Beyond the headline was an even bigger coup for the High. The exhibition, opening next fall, is the start of yet another museum partnership that promises to bring great art to Atlanta over the next few years. Other museums have forged partnerships. But since the mid-1990s, the High's director, Michael E. Shapiro, has been the master, sealing multiyear links with museums including the Louvre, the Museum of Modern Art, the Bargello and the Opera di Santa Maria del Fiori in Florence. But an idea he called "so obvious" was once controversial, and it still can be. In 1991, the Museum of Fine Arts in Boston signed a 20-year, $50 million agreement to provide exhibitions from its collections, starting in 1999, to a new Nagoya/Boston Museum of Fine Arts in Japan. In 1992, for $4.4 million, the Whitnew Museum agreed to create four long-term exhibitions drawn from its permanent collection for the San Jose Museum of Art, then just 22 years old and about to open a new wing. Protesters pounced, criticizing the costs, which exceed the usual loan fees. "People said, 'you're monetarizing the collection; you're leasing out the collection,' " said David A. Ross, who headed the Whitney at the time. On the borrower's side, visitors often pay the price. This year, for example, while the Musée d'Orsay in Paris renovates, it is sending hundreds of Impressionist and Post-Impressionist paintings to "partner" museums including the Fine Arts Museums of San Francisco and the Frist Center for Visual Arts in Nashville. In return, Orsay will collect 10 million euros, according to The Art Newspaper, and tickets will cost up to $25. Although Mr. Shapiro has paid large fees — about $7 million for his 2006-9 partnership with the Louvre — he said that his arrangements were "not parallel" to that deal. The High's payment for the Titians was akin to normal exhibition fees, he said. He also makes a distinction between his partnerships and collection-sharing agreements, like one allowing the Museum of Fine Arts in Houston to borrow dozens of objects on a rotating basis from the Korean National Museum, for no payment other than exposure. "Embedded in our partnerships is a deep and sustained give-and-take," Mr. Shapiro said. "It's not a rental." Curators have co-organized the exhibits; they have conducted joint research and international workshops; staff members have crossed the Atlantic on exchanges. The Louvre, which can no longer depend totally on government financing, learned how to raise money from the private sector and how the High devises educational programs. With the Bargello, the High helped conserve Verrocchio's "David," the Renaissance bronze it then borrowed. But there is no question that the High's biggest gain is in visitors — more than 1.3 million flocked to the museum for seven exhibitions of nearly 500 Louvre treasures — and visibility. Because of the Louvre partnership, the High was invited to join an exclusive group of large museums, which led directly to the partnership with Scotland's National Galleries. It was at a meeting of the group that Mr. Shapiro heard details of their financial bind. Titian's "Dianas," owned by the Duke of Sutherland's family for more than 200 years, have been on loan to the Scottish museums since 1945. In 2008, the duke moved to retrieve and sell them. Uproar ensued. So, in lieu of paying taxes on the sale, he gave the National Galleries and the National Gallery in London the chance to buy and share them. Within months, they raised £50 million for one, but not the other. During a break, Mr. Shapiro approached the Galleries' director, John Leighton: "I said, 'If you have any thought of bringing them to the U.S. to help your efforts, we'd help.' "
That's how much partnerships infuse his thinking. "Venetian Masterpieces from the National Galleries of Scotland" is much desired and will also travel to the Minneapolis Institute of Arts and the Museum of Fine Arts in Houston, but, Mr. Shapiro noted, "Twenty-four other museum people in the room didn't think of going over to talk with John Leighton." Weighing the pros and cons, Peter Marzio, director of the Houston museum, said that partnerships like the High's were not for every museum, not even every "aspirational" museum. "Some would rather spend the money and time building their own collections," he explained. "But partnerships can also be an important educational opportunity. Eventually, they will deepen the cultural commitment of the city." With so many successes — not just at the High, but in places like Nagoya, where some 3.5 million visitors have seen 2,700 works from Boston, many taken from storage — partnerships seem poised to spread. As Mr. Shapiro recalled, it was after the High exhibited Ghiberti's "Gates of Paradise" panels from Florence in 2007, which traveled to the Art Institute of Chicago and the Metropolitan Museum of Art, that other museums really noticed. "People began to call and ask, 'How did you do that?' "